It is used for initiation of milk flow and pain-free suction from mammary glands of the breast. PACK SIZE : 1 BREAST PUMP in a box. Mother’s milk is the best source of nutrition for baby, but you may not always be there to feed your child. So Manual breast pump makes it easy and comfortable with the benefit of natural breast milk. Select a pigeon breast pump that is the most suitable and comfortable for you. Always remember that a pump with a strong suction power does not mean that it is good for all users. A baby exerts a pressure of 80 to 100 mm HG. Ensure the sucking force by the pump is appropriate and no pain is felt in the mammary glands. Sucking process is different from pulling and rhythmic suction is better than hard pumping. 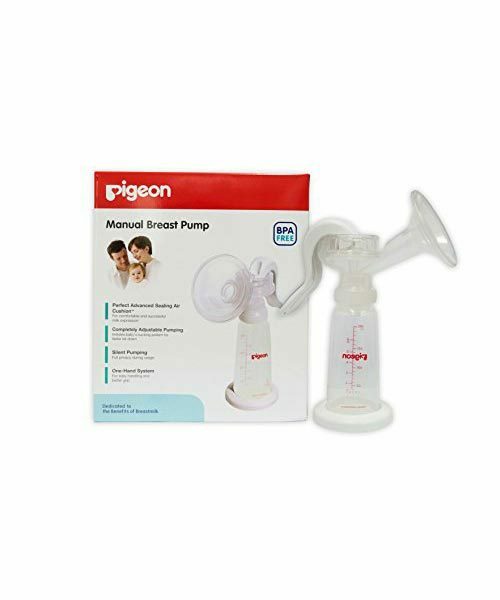 Pigeon Breast Pump Manual with a pumping strength of above 200 mm HG is not recommended for breastfeeding mothers. Ergonomically designed Handle – handle with better grip & easy handling reduces hand fatigue. It is very easy to pumping even with one hand. Pigeon Products is Quiet, compact and lightweight. Simple and easy to clean – Fewer parts, which makes it easy to assemble, use and clean. It Hygienic design prevent milk flowing from back to the funnel. Bottle stand Secures by prevent spills.